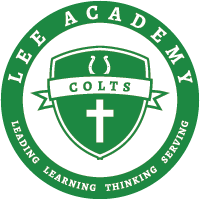 Lee Academy opened for the 1970-1971 school year with an enrollment of 654 students in grades 7-12. The purpose of the school was to provide an educational environment for excellence through the maintenance of high academic and behavioral standards, concentration of college preparatory curricula, and retention of local control of policies. The superior staff, faculty, and student population, united by common objectives and supported by affluent and industrious groups, provided a strong basis for success. Although in subsequent years, depressed local economic conditions and escalating operation costs have made the task more arduous, the school continues to meet its objectives. Lee Academy confidently faces the challenges of the future because the school enjoys a student body who, though fewer in number, are above average in ability and motivation and because it parents, administration, and teachers are far-sighted and self-sacrificing in their pursuit of excellence.